A while ago Sylvia and her friend Louise and I all made the Piece O’Cake Appliqué Sampler. We were all learning appliqué through an online course. Sylvia and Louise have kindly agreed to let me share with you their samplers, so now you can see how one pattern can look so different with different fabric and quilting choices. 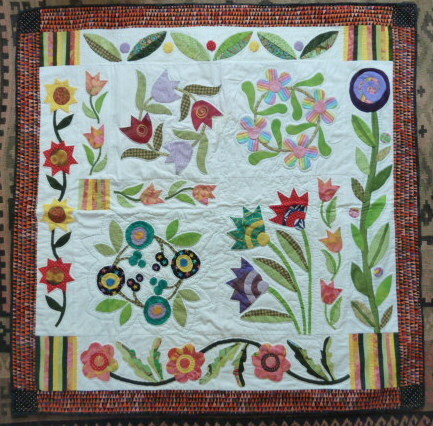 I have to say that Sylvia’s and Louise’s quilting is beautiful. Mine is less so because I just didn’t like this quilt. 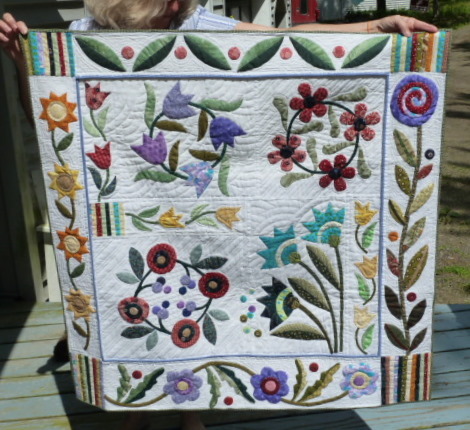 It was a strange size – which is why I added a border to it – and I didn’t want to spend ages hand quilting tiny stitches, I just wanted it “done” [Doris I can hear you taking a big breath in. 🙂 ] so I used Perle 8 thread and large stitch quilting. Anyway here they are. The first quilt is Louise’s, then Sylvia’s then mine. 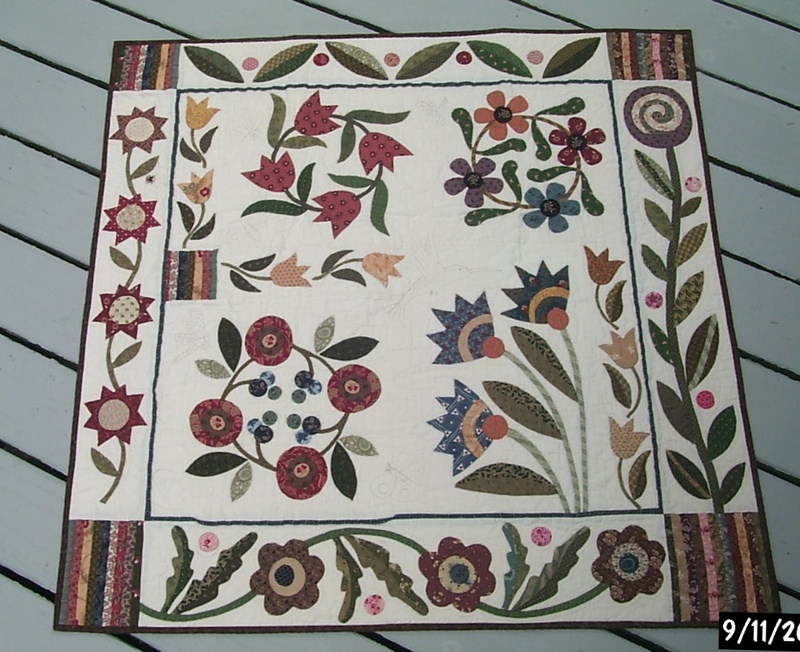 Good morning, Love the quilts especially as they are samplers. My query is did you learn different methods of applique? I can think of at least different ways of doing applique and the different techniques you use would depend on what and where your were appliqueing. Just wondered if you only learnt one technique. Sorry somehow the 8 got left out of the different techniques. Now on thinging, I can even think of more. The way it was taught was using the overlay method which I found very difficult and “not my style”. Then In another class I learnt back-basting which I found very easy and enjoyable so I finished it using that technique. I also have my own trace and baste technique which I use for reverse appliqué and sometimes ordinary appliqué as well. All of this is “needle-turn”. Cheers and thanks for your comments. Oh ladies, I’m so jealous. It must have been great fun to work on them together. The quilts are just wonderful. I love all three of them. It is always fun to see a variety of takes on the same pattern. Thanks for the show and congrats on the finishes. I think they are all lovely. Each of them does look different with the different fabrics used but all are lovely. I particularly like the reproduction fabric used in nthe middle one. I also think your is really nice with the extra border around it. Well done. The top one is pretty too just not fabrics I would use, I’m a reproduction tragic. Amazing how the same pattern looks so different when diverse fabrics are used. Congrats to the 3 of you. Lovely quilts. Each so different. Who did you do the online course with? A lady called Debbie Madigan had an online course through a Yahoo Group.